Located at 68°28′W, 12°15′N, 80 kms off the coast of Venezuela, Bonaire also includes the uninhabited island of Klein Bonaire (2.3m²/6km²). Bonaire itself covers 111m²/288km2. The island was originally a coral reef which was pushed up by tectonic activity and in fact there are a few areas still below sea level in the south, where evaporated salt is collected. Mount Brandaris at 790ft/240m is the highest point and offers advantageous views. Bonaire is home to one of only four nesting grounds for the Caribbean flamingo. No human entry is permitted to this area but you can view this spectacular gathering from afar. The island is known as a diver’s paradise as well as for its unspoiled environment and is a leader in nature conservancy. The whole of the island’s coastline has been designated as a marine sanctuary. Bonaire is also a Mecca for mountain bikers, birdwatchers and eco tourists. 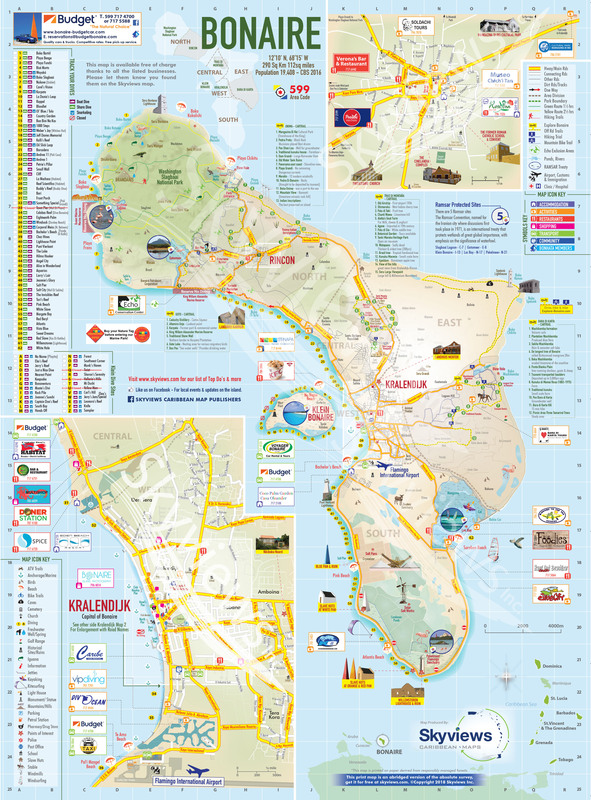 Going to Bonaire and wondering where to stay, what to do, where to eat and how to get around? 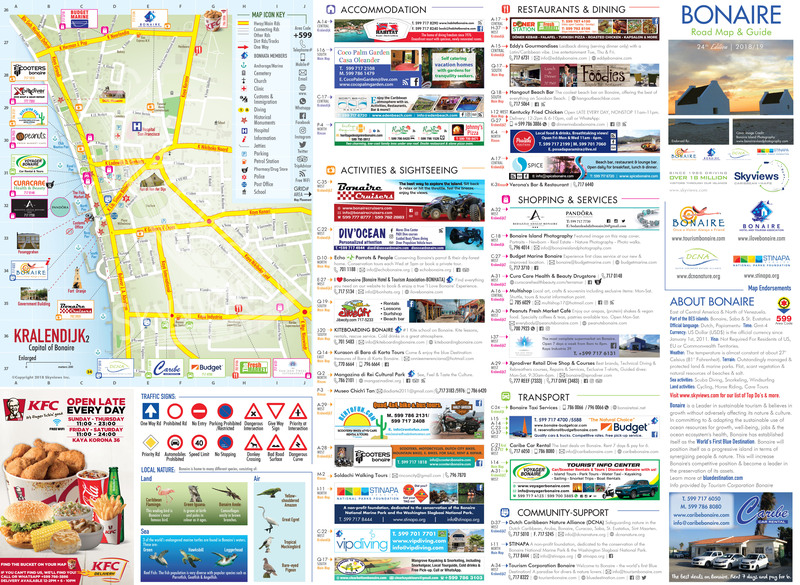 We’ve got you covered with our list of hotels, restaurants, activities, car hire, shopping & more. Browse through for more details. Completely disguised, including speech, locals from each village dress and arrive early in groups at the Lt. Governor’s home to dance and play outside wishing the family a Happy New Year (“Bon Aña”). The Lt. Governor thanks them with a bottle of rum, held and dispensed by a designated member. Visitors will have the opportunity to experience food, culture, local handcrafts and all things offered on Bonaire. The district of Kralendijk demonstrates its Carnival spirit with the presentation of its own children parade. This is a prelude to the Grand Carnival Parade. Local musicians create an exceptional ambiance in Rincon by playing their latest carnival hits to the delight of hundreds of marchers dressed in resplendent costumes. The end of the Carnival season is marked with a Parade ending in Kralendijk followed by the symbolic burning of "King Momito" which takes place on the parking lot of the stadium. Public Holiday- Easter Monday - Simadan stems from Bonaire's slave days and celebrates the growing season's harvest (typically March/April). The festive harvest celebration in Bonaire varies from other places, perhaps, as a direct result of the way slaves on Bonaire were treated. Public Holiday in honor of King Willem Alexander. Youth Center Jong Bonaire's annual fundraising event. During this event the bay will be filled with sails from all kinds of sailing divisions, all competing for their class championship. The first known arrivals were the Caquetio tribe of Arawak Indians who reached Bonaire in their dugout canoes around 1375-1325 BC. Their traces remain in the form of many rock carvings. They called the island Bonay, meaning low country and this was modified by the early Spanish and Dutch to Bojnoj and Bonaire. The Arawaks lived as a peaceful, fishing-based culture until the arrival of Amerigo Vespucci on September 6th, 1499. He initially named Bonaire the Isla de Palo Brasil after the Brasilwood found there which was used as a dye. Vespucci put Bonaire on the new world map but inadvertently helped the Spanish to return there in 1527, and the Indians were forcibly deported to what is now the Dominican Republic to work in the copper mines. Bonaire’s first official settlement, Rincón, was established with successful exports in salt, meat, hides, and divi-divi pods (used for tanning in nearby Curaçao). The Dutch and Spanish fought over the island for eighty years, with the Dutch finally taking control in 1636. The British also had brief control over the island and it is they who established the capital Kralendijk. Slavery was abolished in 1862. During World War II, when the Netherlands were occupied by the Germans, Bonaire became a protectorate of the US and Britain, and an internment camp was built, housing several hundred Dutch, German and British Nazi-sympathisers. This facility was later converted to an hotel! Since 2010, Bonaire became a special municipality of the Netherlands (although not part of the European Union) but the results of a referendum scheduled for 18 December 2015 might very well bring change. Bonaire is a leader in the Caribbean in ecological responsibility and there are many initiatives to preserve the fragile balance between human occupation and protecting nature. Bon Bini na Boneiru – Welcome to Bonaire! – is the greeting for visitors. African traditions are still alive today in the Maskarada (or masquerade), a costume parade festival with music and dancing; and Barí is another annual festival which allows everybody to catch up on all the gossip and the news.